Time to leave Vancouver. Sad to leave our generous hosts. And, there was still one piece of apple pie left over from Sunday, we had it for breakfast. And… you can’t have some pie without ice cream. We said our farewells and retraced our path across to Vancouver and through the only road in Stanley Park we hadn’t ridden at least once. We met a bicycle commuter who offered to show us a bike friendly way out of town. We followed him for about 5 miles until I pulled up lame with my seventh flat tire. 😦 a brad stuck through my rear tire, naturally. I fixed it as fast as I could and as we started rolling, Bob’s rear tire made a weird, cork popping sound. Upon inspection, his rear tire, which had a bulge, popped off a piece of tread and sidewall. Stop and replace his tire. Our guide was long gone so we had to fend for ourselves on routing out of Vancouver. 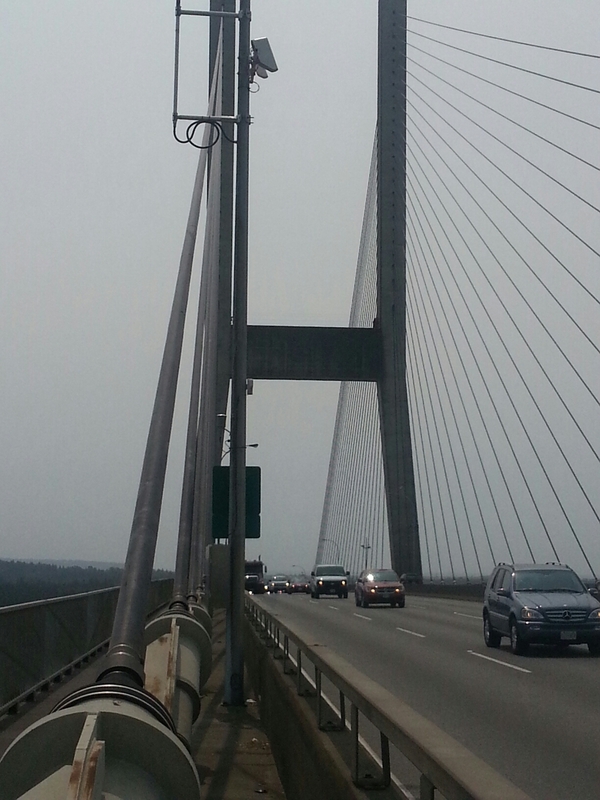 Turns out, it is a long way through non-bike-friendly sections of east Vancouver to get to the border. 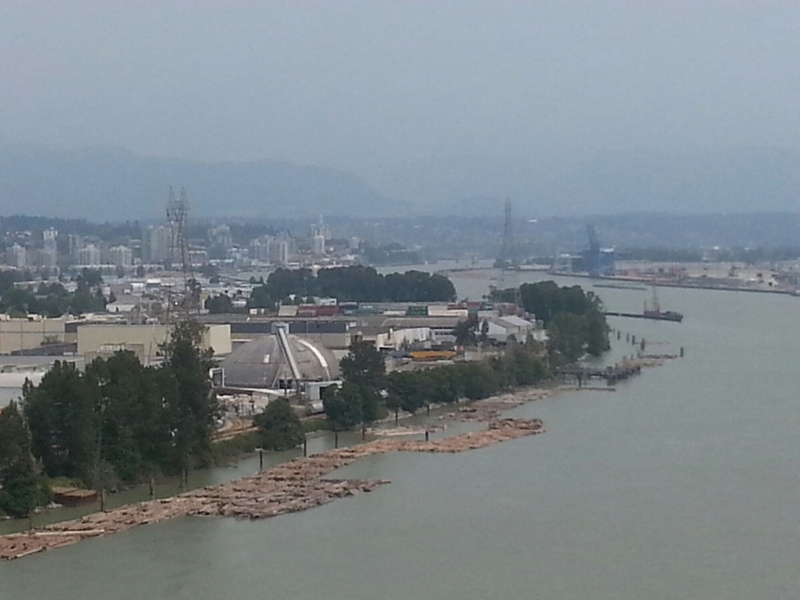 We did get to see some industrial sections and rivers with logs rafted together. We passed over the third longest and highest bridge on the ride (behind the Golden Gate and Columbia River). It was a suspension bridge. When I looked up, there was a guy walking across the bridge in this picture. He’s in the upper right. Finally out of the Vancouver area and on to the US Border crossing at, wait for it, Blaine. It felt great to be crossing back, even though we’d only been gone a few days. Canada was wonderful and the people were universally friendly. 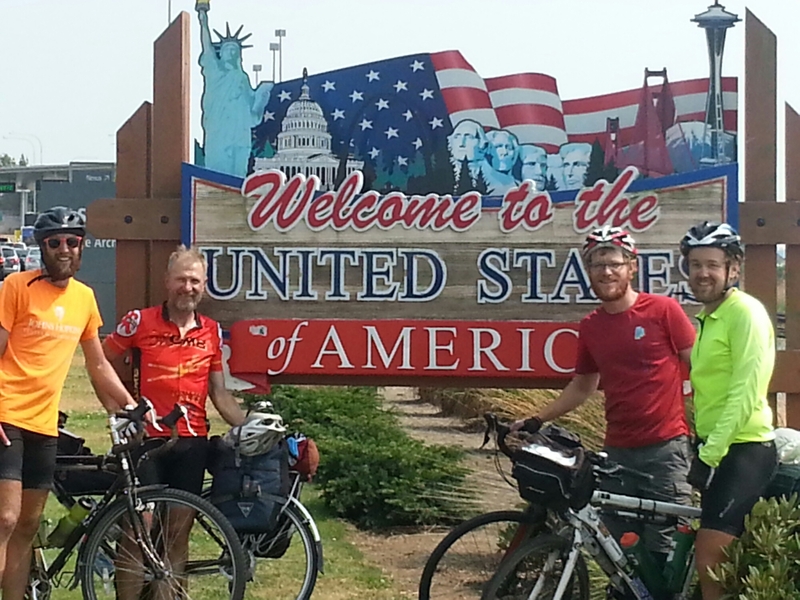 But, we still had over 20 miles to go to our hosts, Jen and Molly in Bellingham, Washington. We got there ahead of our appointed time so, what to do in a college town with multiple brew pubs? 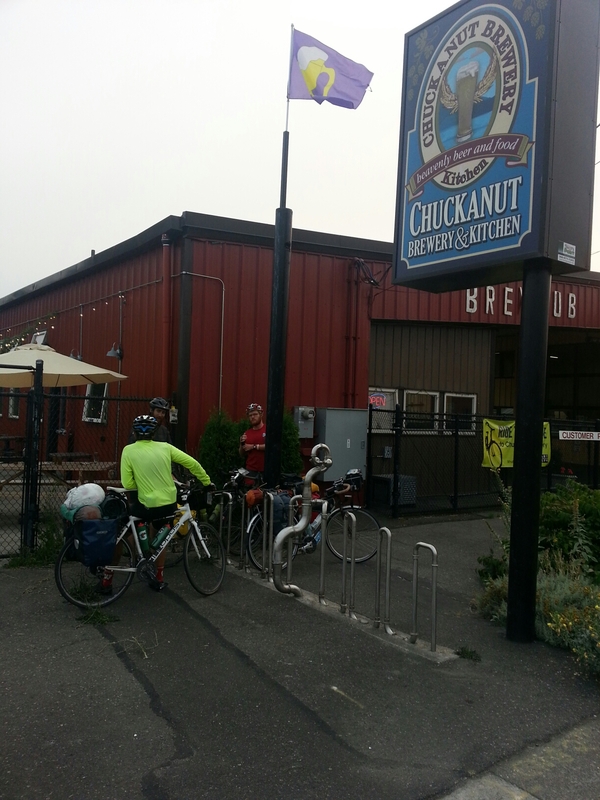 We ate and had a beer at Chuckanut Brew Pub, because it was either: the first we crossed, we liked the name (named after a mountain range where the Cascades are closest to the ocean) or, because it had won Best Small Brew Pub in 2002. Take your own guess. Of course, we had to top it off with ice cream, at Mallards, my vote for the best ice cream shop venue.